The cooler temperatures we’re having in Texas ( a whopping 75 degrees! ) has me in the mood for some tasty comfort foods. 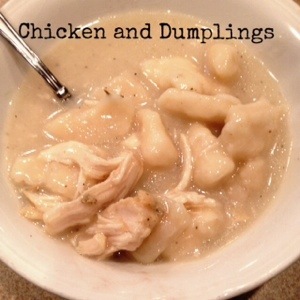 And because I am a true southern girl, I had to share my favorite Chicken and Dumplings recipe with you. The flour in the dumplings thicken up the broth to create a great, creamy sauce. While this dish does take some time and effort, it truly is a perfect and comforting meal. I try to make this ahead of time and let it sit in the fridge a few hours before I heat it back up. It’s tastefully filling and my kiddos love it. Bring the water to a boil in a large pot. Add the chicken, 1 teaspoon salt, onion, celery, garlic, bay leaf and parsley to the pot. Reduce heat to simmer and cook the chicken, uncovered, for 2 hours. The liquid will reduce by about one third. 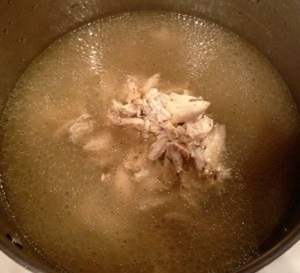 Once the chicken is cooked, cut the chicken meat into bite-size or a little bigger than bite-size pieces and drop them into the pot. Strain the stock to remove all the vegetables and floating scum. You only want the stock and the chicken, so toss everything else out. Pour 1 1/2 quarts (6 cups) of the stock back into the pot. Add coarsely ground pepper, the remaining 1/2 teaspoon salt and the lemon juice, then reheat the stock over medium heat while preparing the dumplings. For dumplings, combine flour, baking powder, salt and milk in a medium bowl. Stir well until smooth, then let the dough rest for 5 to 10 minutes. 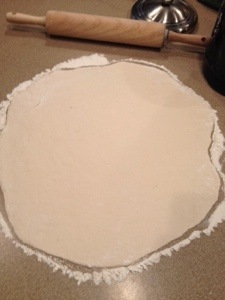 Roll the dough out onto a floured surface to about a 1/2-inch thickness. Cut the dough into 1/2-inch squares and drop each square into the simmering stock. Use all of the dough. The dumplings will first swell and then slowly shrink as they partially dissolve to thicken the stock into a white gravy. Simmer 20 to 30 minutes until thick. Stir often. When the gravy has reached the desired consistency, ladle four portions into bowls and serve hot.